TRUE WIRELESS DESIGN- No wires, no worries. Enjoy lossless sound quality and a stable signal transmission with a wireless range of up to 35 ft in this completely wire free design. ENC MICROPHONE TECHNOLOGY- A high stability MEMS microphone + DSP environmental noise cancellation technology allows you to communicate in loud environments as if you were talking face-to-face. 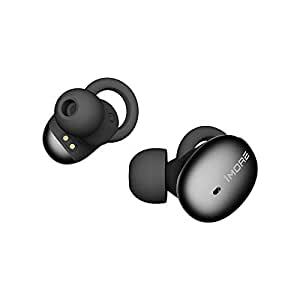 TWO BLUETOOTH PARING MODES- Utilize standard Bluetooth pairing with both earpieces for an immersive music listening experience, or single Bluetooth pairing with the right earbud convenient for phone calls or smart phone usage. PORTABLE CHARGING CASE- Allows for easy storage/protection while not in use, and simultaneously charges your headphones when stored in the case. Achieve 7.5 hours of music playback or phone calls giving you the freedom to enjoy your music anytime, anywhere. PERFECTED ERGONOMICS- Lightweight earbuds with 45Â° oblique-angled nozzles naturally match the curve of your ear canals for a tight, secure fit. Additional silicone ear tips and O-Hook grips ensure you get the right fit.